The third and final installment in my series of Nature Silhouettes Stamp Set #11154 is the wolf baying at the moon. 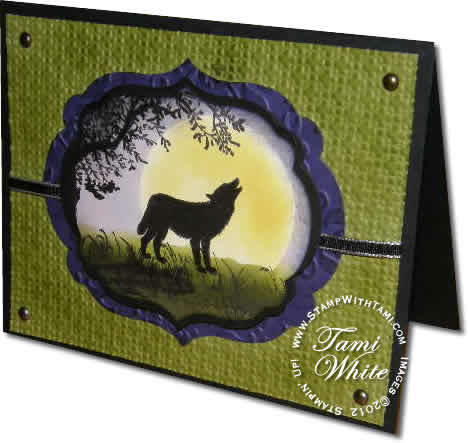 This time my inspiration came from a similar swap card from my friend Debi Pipen. The background is done with sponge daubers #102892, and masked the moon (see similar video tutorials linked on part 1 of this series). The Labels Framelits #125598 create the layers, and some texture comes from both the Vintage Wallpaper #120175 and Square Lattice #119976 impressions folders.